I don't care that it's September, and even though it's still 80 degrees outside, it technically means that summer is over. 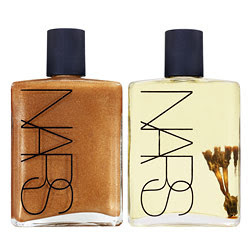 I am going to continue to rock a golden glow well into fall and even winter, thanks to the NARS Mini Monoi Body Glow and Body Glow II Set. I have been seriously intrigued by this duo for a few months now ... the essence of monoi in both bottles has held my interest ever since I first spotted the duo on Sephora's website. So even though the $35 price tag seemed a bit steep, I decided to fork it over in the name of beauty discovery. Each of the two bottles is formulated with Monoi de Tahiti oil. Monoi, for those beauty chicks who need a bit of a definition, moisturizes and conditions the skin with a blend of coconut oil and the essence of tiare flowers. Not only does this make the products lend skin a totally beautiful gleam, it makes them smell absolutely fantastic. They smell sweet and delectably delicious without being overbearingly so -- and each makes skin so lovely that perfume isn't even necessary! But enough generalization about the two products, let's get to the nitty gritty about the two individuals. Body Glow is the darker of the two, looking a bit scary in the bottle with its chocolatey brown hue. It's crafted with monoi oil, vanilla essence and chocolate shimmer that, rather than making skin too deeply brown, coats the legs and arms with the prettiest golden glow. Body Glow II, on the other hand, looks anything but intense in the bottle. It's transparent, but created with just enough shimmer to leave legs looking utterly gorgeous. Used separately or together, these two bottles impart the most perfect glow. I actually prefer to use them together, as they combine to form a sun-kissed shimmer that's unbelievably radiant and real-looking. And the coolest part? They each contain an authentic tiare flower as a reminder of the exotic origins of Monoi de Tahiti! All in all, this duo will leave you absolutely glowy from head to toe ... just what you'll want come fall. Sounds lovely! I may have to invest.